Introduction: In an attempt to reduce the incidence of development of pancreatic insufficiency following subtotal pancreatectomy, lesser procedures (central pancreatectomy, enucleation) are advocated for selected patients. Enucleation of pancreatic tumors carries the risk of pancreatic duct leakage or inadequate resection. We have performed laparoscopic enucleation of pancreatic tumors in selected patients since 1992. We present the feasibility and short term outcomes of this approach. Methods: Since 1992, 28 patients have undergone enucleation of pancreatic tumors at our institution. Laparoscopic enucleation was attempted in 19 patients. We retrospectively reviewed the demographic features, operative indications, conversion rate, operative time, blood loss, average length of stay, postoperative complications and mortality rate. Results: Laparoscopic enucleation was attempted in 19 patients. There were 13 females and 6 males. The mean age was 56 yr (range, 34-74 yr). The average BMI was 24.6 (range, 18.4-34.4). The indications for surgery were neuroendocrine tumor (6), IPMN (4), pancreatic cyst (6), and metastasis from renal cell carcinoma (3). The locations of the tumors were head and uncinate process (9), neck (6) and body (4).Three patients were converted to an open operation (15%) because of inability to identify the lesion (1), posterior location of the tumor (1), and intra operative discovery of liver lesions with metastatic characteristics during intra operative ultrasound (1). One patient underwent concomitant right hepatectomy [for liver metastasis ]; another patient underwent esophagectomy [for esophageal carcinoma]. The mean operative time was 193 min (range, 60-450 min). The mean blood loss was 72.5 ml (range 0-500 ml). None of the patients required intraoperative transfusion. The average length of stay was 23 days (range, 4-64 days). The overall complication rate was 57% (pancreatic fistula in 3, pleural effusion in 1, biliary leakage in 2, intra-abdominal bleeding in 3, and intra-abdominal collections in 2). Patients with bleeding needed re-exploration. Biliary and pancreatic leaks were managed successfully by non-operative means. There were no deaths. Conclusions: Laparoscopic pancreatic enucleation is feasible in selected patients with complication rates that compare favorably with equivalent open techniques. Disruption of biliary or pancreatic duct can be managed by conservative methods in the majority of patients. 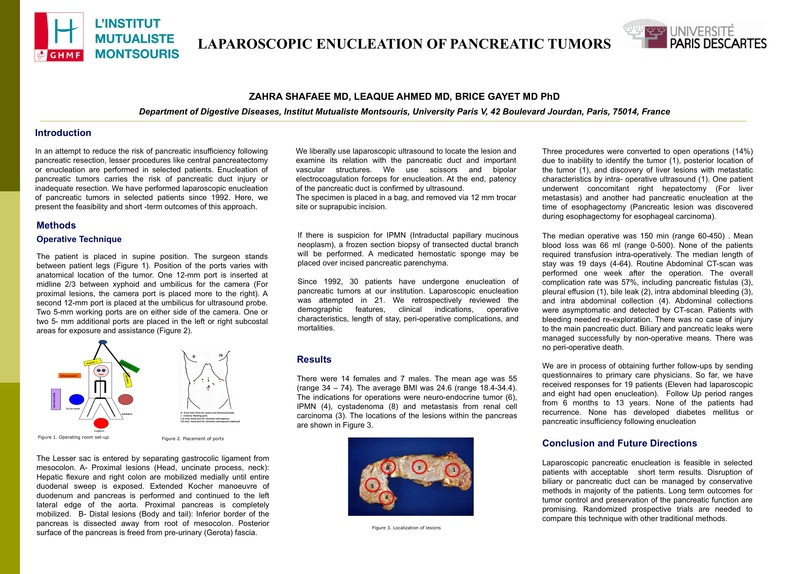 Long term outcome of laparoscopic pancreatic enucleation requires further study.